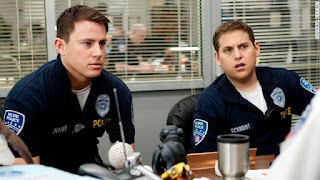 Synopsis: Schmidt (Hill) and Jenko (Tatum) are a pair of underachieving police officers who went to high school together. After screwing up their first arrest, they're reassigned to the revived 21 Jump Street unit and sent as undercovers officers to a local high school to bring down a growing drug ring. Alas, 7 years after graduating high school themselves, things are not as they remember them. Andrew: Hello readers! It's been almost a week since our last review, and we apologize for that, but I think the wait was worth it because Sarah and I saw 21 Jump Street this afternoon. Starring Jonah Hill (Moneyball) and Channing Tatum (The Vow) and based off the old television show that jump-started a young Johnny Depp's career, we've been waiting a long time for this film, haven't we Sarah? Sarah: Yea we have! From the first time we saw the trailer we were like, "We gotta see that!" And I don't know about you, but I think it was AWESOME! A: I know we agree a lot more than we disagree, but I can’t agree with you more here. 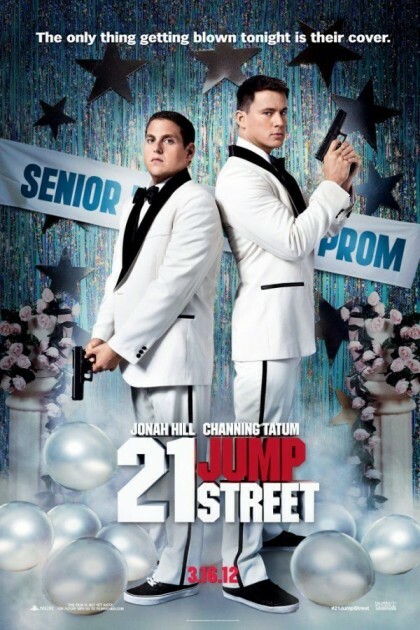 I also can't stress this enough, readers - 21 Jump Street is the funniest movie I've seen in theatres since The Hangover. And honestly, because of the script, the performances and the organic nature of the humor in this film, I might say it's better. S: I have to agree with you! The chemistry between Jonah Hill and Channing Tatum was perfect. The classic "used-to-be-nerdy" guy and the original jock teaming up against the bad guys but in such a great way! I love how they make no bones about the fact that it is a homage to the original TV show. Now, there are a ton of fun moments in this movie that we will not be giving away in this review. It is so clever that you all really have to go see it for yourselves. A: There are countless things in this movie that had me laughing out loud, and if we were sitting closer to the aisle I might have been rolling in it, that's how funny this film is. And you're SPOT ON about Hill and Tatum's chemistry. This movie wouldn't have been nearly as good if it weren't the two of them, but they were SO funny playing off of each other. We've known Hill is funny for a while, and he's great in it, but Tatum absolutely kills it. Playing the dumb jock with a heart of gold, his facial expressions and delivery are impeccable. I also love that they took an original concept and turned it on its head. In the beginning of the movie Hill's the outcast and Tatum is the popular guy, and when they get assigned to the 21 Jump Street squad and are sent undercover into high school again, their roles flip because of their incompetence. And it's a stroke of genius. S: It really was a stroke of genius. I will say, I wasn't laughing as much as Andrew was. I did feel that they gave away a lot of the funny parts in the trailer, but they play into the movie really well. The set-ups for the jokes are awesome! Definitely going to get some one-liners out of this movie. And this is really the first time that we are seeing a skinny Jonah Hill hit the big screen and I gotta say, I don't hate it! I don't look at him and go, "oh he's just funny because he's the lovable chunky kid" anymore. He is just continuing to show that he has some serious movie chops. A: I do think it might be fair to say this film may be funnier for the male crowd simply because of the kind of humor it uses, but I think it's funny all-around as well. It has funny moments were it's a satire (i.e. jokes about modern day things) and moments were it's a parody (like the over-the-top action sequences and the guys' reactions to said sequences, or music that sounds like a Michael Bay movie at points). It all works. I could gush on and on about this movie but I think we've said more than enough to boil it down and say: just go see it in theatres. Please. S: Yes, see this movie. It's really fun and I would have to venture a guess that we will be buying this on DVD when it comes out. A: Oh I guarantee it.